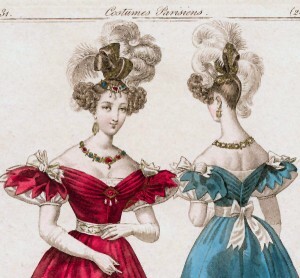 Today we have a pair of French gowns that are most likely for evening. With this era, it can sometimes be difficult to tell, but the low, off-the-shoulder necklines, the short, puffed sleeves, the hairstyles, and the shoes all point to evening wear. Some call this transitional era the “Romantic Period”, when the classical styles of the Regency evolve into the more formal styles of the early Victorian period. By this point, there’s very little left of the empire styling. Waistlines slit at the natural waist, and skirts are full, though still A-line in shape. Bodices are tight, with an emphasis on wide, slanting shoulders. 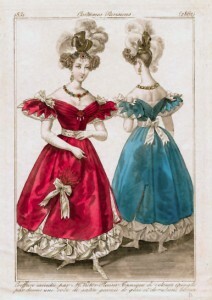 These two gowns are likely the same dress, shown front and back. The details appear to be identical, only the color differs. They are vibrantly hued in red and blue, respectively. As you can see, the puffed sleeves are quite large, with a Van Dyked overlay and a white undersleeve. The pleated neckline fits just off the shoulder and dips into a low V. There is a small inset at the V neckline for modesty. The skirt has a white underskirt that’s puffed at the hem and embellished with diagonal bands and bows. The outer skirt is slitted at intervals and bears a feathery decoration. 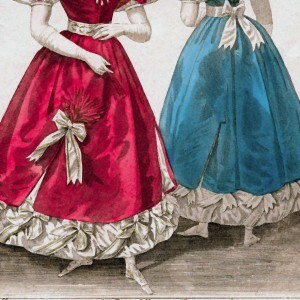 There is a white sash that ties at the back of the waist. Both ladies wear elbow-length white gloves and square-toed shoes that lace at the ankles. The lady in red carries a small matching fan and her hair is elaborately coiffed, with curls at the temples. A jeweled hairpiece and large feathers adorn her hair, along with a brooch at her neckline and a heavily jeweled necklace. Do you agree that this dress is for evening wear? What is your favorite detail?